Code updates happen for one main reason: safety improvement. 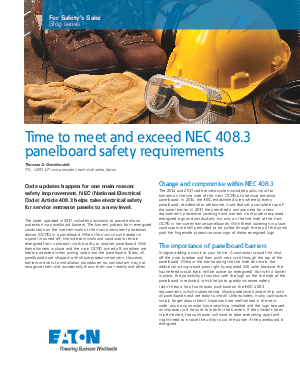 NEC (National Electrical Code) Article 408.3 helps take electrical safety for service entrance panels to a new level. The code, updated in 2017, includes provisions to provide shock protection via panelboard barriers. The barriers protect from energized conductors on the line terminals of the main overcurrent protection device (OCPD) in a panelboard. When the main circuit breaker in a panel is turned off, line side terminals and conductors remain energized from upstream via the utility or another panelboard. With these barriers in place and the main OCPD turned off, installers are better protected when pulling wires into the panelboard. Today, all panelboards are shipped with shock-protective barriers. However, barriers are new to installation procedures, so contractors may not recognize them and accidentally throw them out—easily and often.